Using boneless chicken breasts that was in the fridge, I cut them into strips and then seasoned with salt n pepper. Bone-in or other cuts can be used in place of boneless. 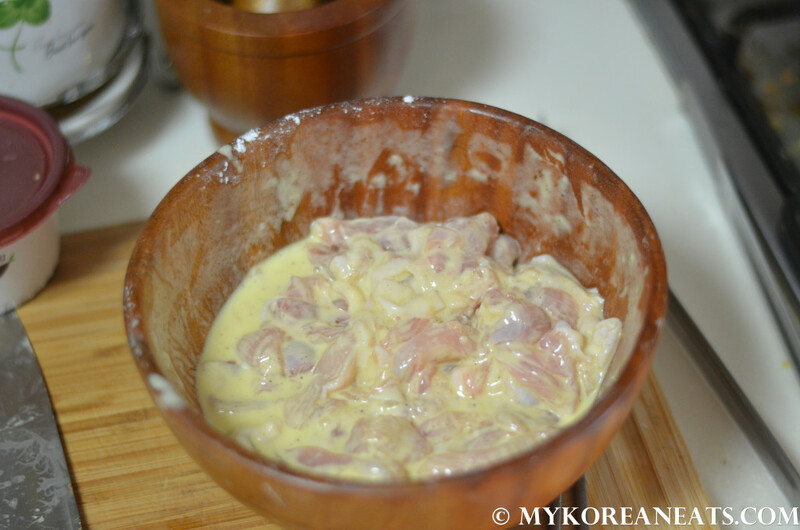 In a mixture of flour, cornstarch, egg yolk, water, and soju, add the chicken pieces and thoroughly coat by hand. Let sit for a minimum 20 minutes in the fridge. 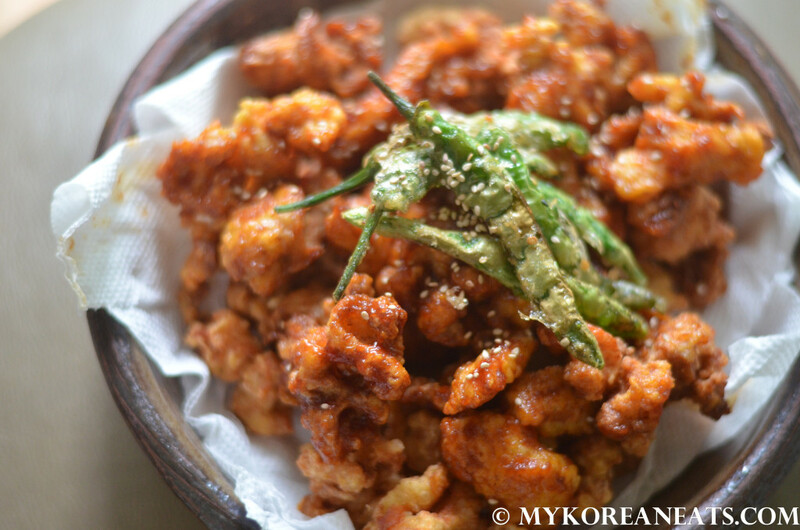 Why use soju? 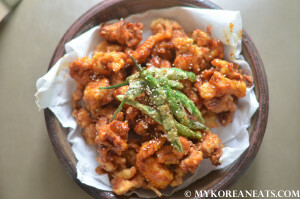 Soju (or vodka) helps limit gluten formation, resulting in crispier birds without any leathery textures sometimes experienced with improperly cooked fried chicken. 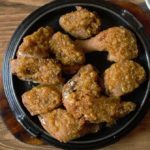 Ideally, canola, peanut, grapeseed, and extra light olive oil are solid choices to fry chicken as they all have a high smoke point and most include heart-healthy unsaturated fats. I used vegetable oil here. Make sure to add the chicken when the oil is hot (test with a breadcrumb) and don’t overcrowd the pot when frying. 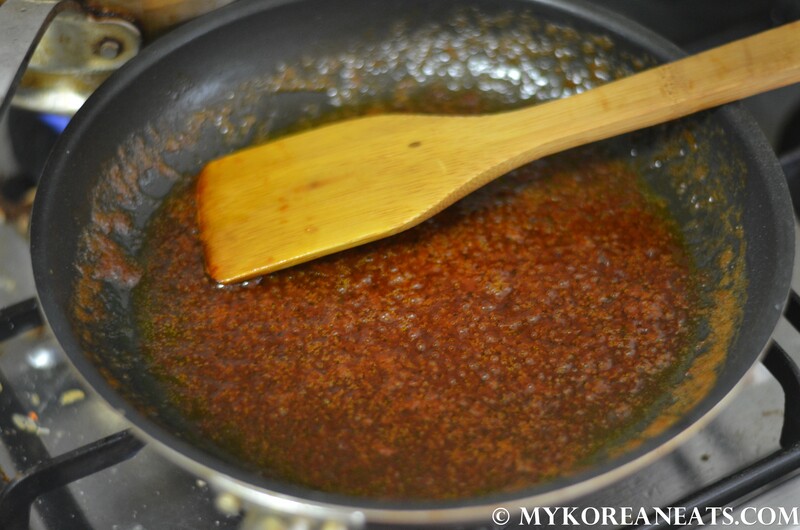 Butter, Tabasco sauce, soy sauce, sugar, cider vinegar, and ketchup make up the sauce for the chicken. As with most cooking attempts, I rarely measure things out but instead rely on “instinct” when I cook. 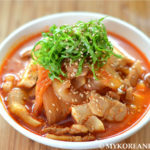 Koreans refer to this as son-maat, loosely translated “taste by hand.” Feel free to add or omit ingredients to your liking, but just make sure the sauce boils and thickens until sticky. The final sauce should look something like this. I really like some heat in my sauce, so I added more Tabasco and red chili flakes. For these pieces of chicken, I fried them about 7 minutes or until golden brown. Then set aside on some paper towels to remove excess oil. If you have a fan handy, cool them down after the fry – this will dry out excess oil and keep the chicken crispier. Lastly, add the chicken to the sauce and mix thoroughly. Final product with fried peppers. 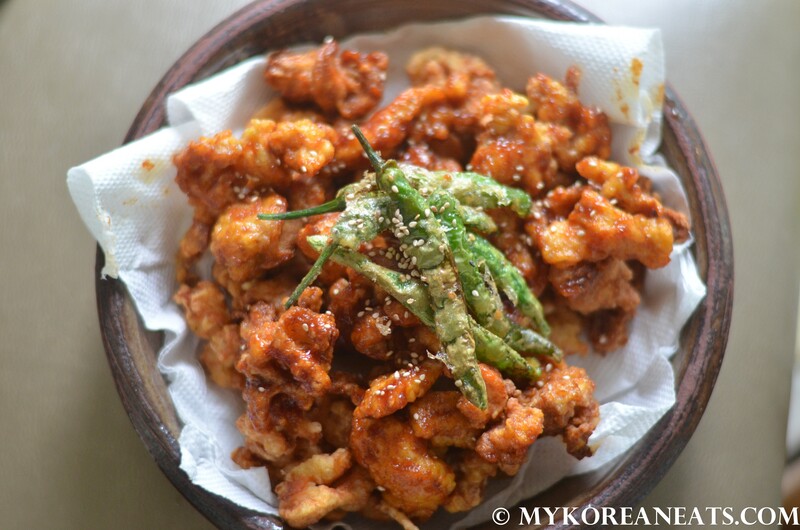 Ideal for a late afternoon or evening snack (anju) with friends or family. Super delicious! (Optional) Sprinkle and rub a generous amount of salt n pepper over the boneless chicken pieces; set aside for a few minutes. If using bone-in chicken with skin, do the same but let sit longer, 15 minutes or more. This draws out extra moisture from the surface of the chicken making it easier to crisp the outer layer. Pat dry with paper towel before coating. 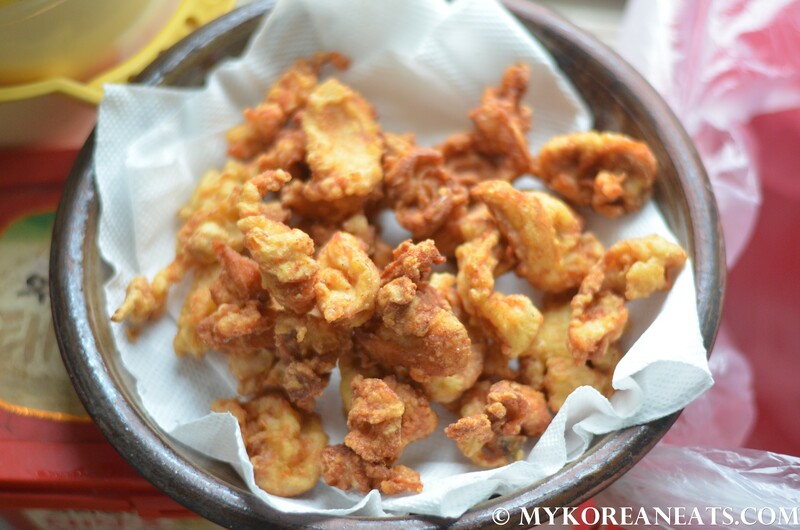 Combine the batter mixture by adding the flour, cornstarch, seasoning, soju, and water together. Mix thoroughly until a slurry batter is formed, slightly lighter than pancake batter. Add more water if necessary. Combine with chicken and set aside in the fridge, 15 minutes. 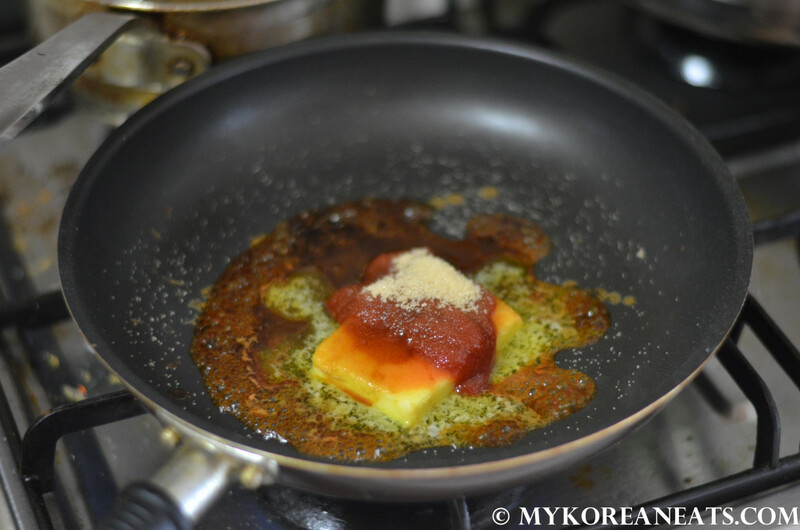 Add sauce ingredients together in a sauce pan. Boil the mixture until it starts to get thick and syrupy, no more than a few minutes. Taste the sauce as you go and feel free to adjust accordingly. 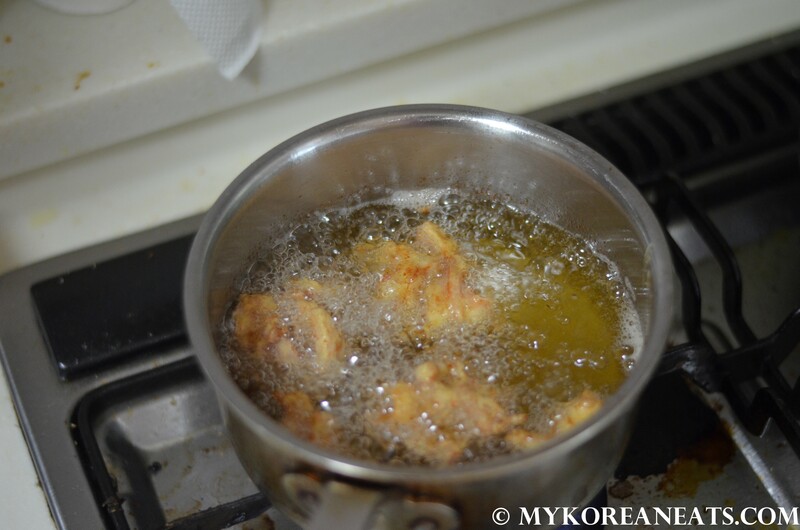 In a heavy bottom pot or pan suitable for frying, add enough oil for chicken pieces to be fully submerged. Heat oil on medium-high (or approx. 350 degrees) and test by adding a breadcrumb. If it bubbles, then it's ready. Add the chicken pieces and fry about 7 minutes or until nicely browned. Do not overcrowd as this will lower the oil temperature drastically. Move the chicken to a wire rack or paper-towel lined plate, let cool/dry for a few minutes. Just in case you have a fan nearby, use it to dry up the excess oil and crisp the outer covering. 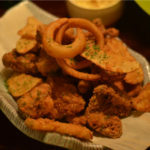 Repeat until all chicken is fried. 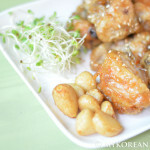 Transfer the chicken pieces directly to the sauce and coat pieces thoroughly. Plate and serve immediately. Enjoy!